Has anyone tried a guitar with fanned frets? Discussion in 'Guitars in General' started by djentleman, Apr 17, 2016. I've been doing a lot of research into Scale length and I was wondering if anyone has played a fan fretted guitar and what they thought about how it played and the sound? I've found that for better clarity on the low strings you want to have a longer scale length so I assume this must be the opposite for the high strings no? Thus you would have a guitar with fanned frets and get near perfect intonation throughout the whole guitar. Or is adjusting the intonation at the bridge good enough? Fanned frets doesn't affect the intonation, it will have the same traits as a non-fanned guitar. I think Blix is correct about the intonation. I owned a Novax Expression series fanned fret guitar and I loved it. It was easy to play and I didn't ever notice that I wasn't playing on a "straight" fretboard. It is nice to have the extra snap and focus of the longer scale on the low strings, while having the easier to bend Gibson scale on top. Ralph Novak made some great guitars. 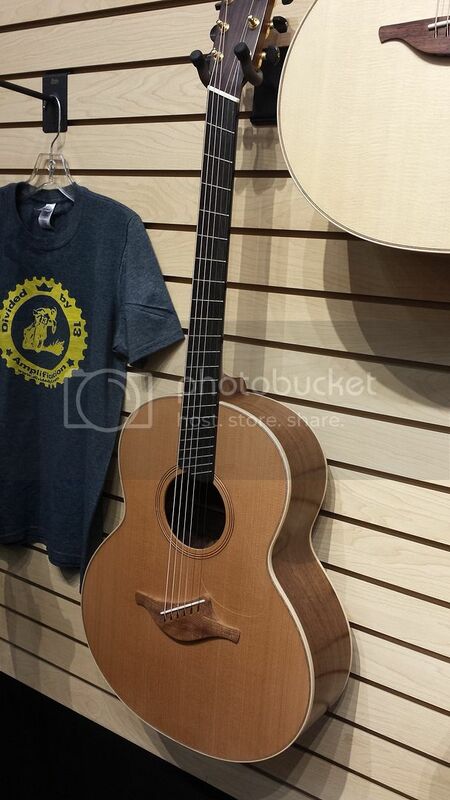 I played a couple at NAMM, while skeptical at first, I think it was actually pretty cool. Easier to play higher up thanks to the frets adjusting to your natural wrist/hand position. I would really like to try one.... No local stores carry any. I played a Lowden just the other day. It was surprisingly comfortable to play. I would definitely rock it if I had the scratch to buy one. Thanks a lot guys. Glad to hear they're good to play, will need to hunt around and try one for myself! I own a Fanned Fret guitar (Strandberg). In my mind it is strictly superior to non-fanned frets in every way that matters (except cost and selection, sigh, but that's starting to come around). Ergonomically better, intonation is better (not by much, but I think it DOES help - pianos are shaped the way they are for a reason...lower pitches like longer scale lengths), and sounds better too. What does surprise me a little bit if the bulk of the fanned frets seem to go longer than Fender scale. IMO the ideal fan on a 6 string would be something like 24.5-25.5" - Gibson slink on the plain strings, Fender punch down low. That was my main reasoning behind thinking the intonation might be better on a fan fretted guitar. Glad to hear your enjoying yours! This picture is like an Escher painting - throws my brain for a loop!